Designed by a Physical Therapist, The EmBrace® Exercise Device (Patent Pending) is an exercise program for adults and children with weak breathing muscles. These muscles affect many aspects of life, including: taking deep breaths, speaking volume, cough strength, posture, shoulder function, shortness of breath issues, and general endurance. 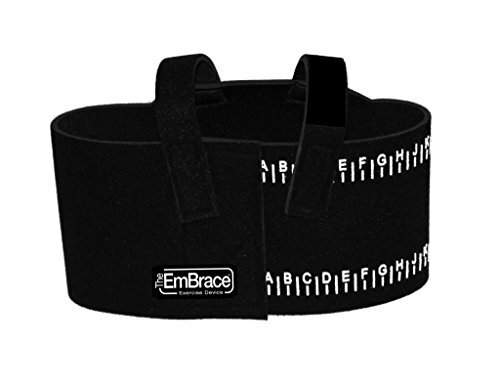 The EmBrace® Exercise Device is worn around the ribcage. It is Hypo-allergenic and Latex free. Be sure to follow all of the instructions for adjusting it properly. Upper Core Technologies is all about innovative and cutting edge interventions for healthy people and those with special needs. The EmBrace® provides a unique solution to a common problem of weak breathing muscles, and anyone can benefit from using it! Simple, easy to use, safe, comfotable. No prescription required. Improves breathing muscle strength and endurance. Simply wearing it IS the exercise! Wrap + Wear = Exercise! For weak and incorrect breathing patterns. Reinforces natural breathing. For ages 12 months and up. Disclaimer: Results vary. Upper Core Technologies does not recommend the self-management of health problems. If you have any questions about this product by The EmBrace® Exercise Device, contact us by completing and submitting the form below. If you are looking for a specif part number, please include it with your message.